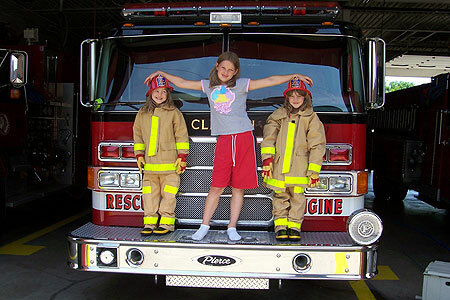 The Clinton Fire Department Education Program is an aspect of the Department used to educate all members of the Community in regards to all safety aspects. The program focuses on all age groups, with it's main purpose to make our community a safe living environment for everyone. 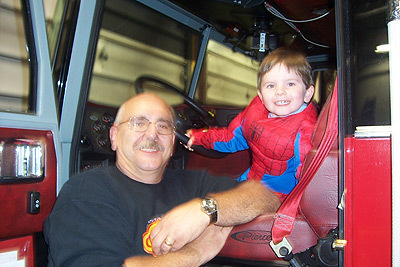 The program contains many different areas; including CPR Instruction, Fire Safety Presentations to the Clinton Elementary School, Fire Safety Programs for the Clinton Safety Town Program, The monthly information article in the Clinton Local, Participation in the yearly National Fire Prevention Week in October, Fire Safety presentations to other educational institutions, The Annual Halloween Trick or Treating Open House in co-operation with the Clinton Firefighter's Association, Annual Open House for the Clinton Fall Festival, the use of the Lenawee County Smoke House to simulate what to do in a fire. In case of fire: "Don't hide, go outside" - Fires are scary, but you should NEVER hide in closets or under beds when there is a fire. Clinton Firefighters may look scary when they're wearing their protective gear, but please, don't hide from them. They are wearing special suits and masks to protect them from flames and smoke; so they can save you. Have an escape plan and practice it with your family - Find two ways out of every room, in case one way is blocked by fire or smoke. Practice escaping by both routes to be sure that windows are not stuck and screens can be taken out quickly. Choose a meeting place outside, such as a big tree or the end of the driveway, so you will know that everyone has gotten out safely. NEVER go back into a burning building for any reason. If someone is missing, tell the Clinton Firefighters. They have the clothing and the equipment to safely rescue people. Know your local emergency phone number - If there is a fire at your house, choose one family member to leave your meeting place and call the Clinton Fire Department from a neighbor's phone. In Clinton, the emergency number is 911. It should be used ONLY for emergencies like a fire. If you should call, stay calm and stay on the line, DON'T HANG UP until told to do so by the emergency dispatcher. 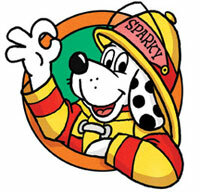 Brought to you by the National Fire Protection Association(NFPA), Sparky the Fire Dog was born in 1951 to help assist with fire prevention efforts across the country. This website is an excellent resource for you and your family to review and practice fire safety activities. Sparky makes fire safety fun! Brought to you by the Home Safety Council. This kid's website is an excellent website for you and your family to review and practice fire safety activities. You can play games, download an activity booklet , or listen to the Red Rover's friends while learning about fire and home safety. Red Rover is cool! The Federal Emergency Management Agency has developed a website to help kids learn about and prepare for disasters. This site contains information on a variety of disasters from floods to tornados. Be prepared ! Smokey The Bear has been working for over 50 years to remind Americans of the importance of outdoor fire safety and wildfire prevention. With reports of devastating wildfire increasing, Smokey Bear's wildfire prevention message is more vital today than ever before. "Only YOU can prevent forest fires"
On this Web site, you will find short lessons about fire escape planning, smoke alarms and general home fire safety. It is recommended that an adult guide children through the lessons. Each lesson is followed by a brief five-question quiz to test children's knowledge of the subject after they have worked through the lesson. Also on the site, you will find games to reinforce the information learned in the lessons. Finally, through a 10-question quiz, children will have the opportunity to earn a Jr. Fire Marshal certificate signed by the Assistant Administrator, U.S. Fire Administration. We would like to thank all of the sites that we have obtained information from. We feel it is very important to provide information like this to our kids and their families.